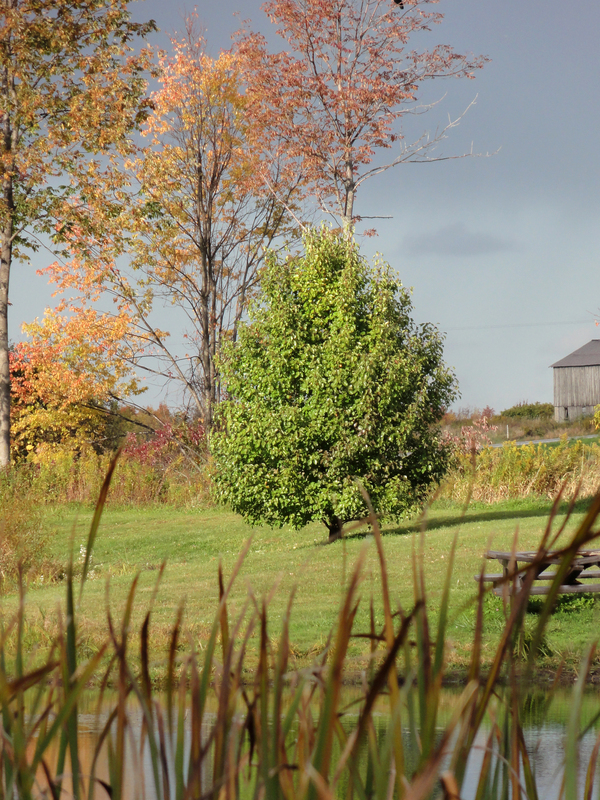 Bradford pear from across the fishing pond looking northeast in mid-October, 2015. Are deciduous trees and shrubs supposed to be green in central New York in mid-October? Most native trees have changed colors and started to lose leaves by this time of year, but many common non-natives (often the invasive ones such as European buckthorn, privet, and autumn olive) can stay quite green until many of the natives have lost most of their leaves. This tree, Pyrus calleryana, Bradford pear, or Callery pear is a case in point. This is a very commonly-planted ornamental tree, originally from Asia. This individual was probably donated to help beautify the pond after its enlargement around 2003, and has not been known to produce fruit, so its threat to the immediate area may be small. But then again, without fruit its benefit to wildlife is also minimal.